The Atlassian Team Calendars team is pleased to announce the release of Team Calendars 3.2. This release was focused on performance improvements of Team Calendars and better support for different languages. Thank you for all your issues and votes. Keep logging issues to help us keep improving! The team has spent a bit of time improving the performance footprint that Team Calendars on Confluence. 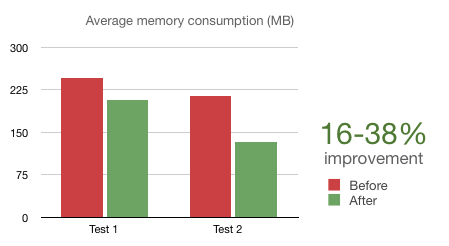 Our particular focus has been on memory usage. In this release of Team Calendars, we've seen an a significant reduction of the average memory used used by Team Calendars. Test 1: Instance 370 calendars, a mix of JIRA, Event and People calendars with an average of 60 events per calendar. Test 2: Instance with 30 event calendars, an average of 900 events per calendar. We've added two new bundled language translations for Japanese and Spanish. We've also improved our translations for German and French. Alternatively, download the latest release from our plugin exchange and install it via the Plugin Administration screen. This should upgrade Team Calendars to 3.2.0 (or higher). This release also had some performance improvements made to the JIRA integration feature. For this, we recommend JIRA customers to upgrade the Team Calendars JIRA Integration Plugin. To do this in JIRA, simply click 'Upgrade' in the jira-ical-feed entry of the Plugin Administration screen. Alternatively, download the latest release from our plugin exchange and install it via the Plugin Administration screen. This should upgrade Team Calendars for JIRA to 1.0.14 (or higher). Note: The JIRA plugin upgrade is optional for JIRA customers who want to upgrade to Team Calendars 3.2.0 or higher. To perform this upgrade, please upgrade the Team Calendars in Confluence to 3.2.0 (or higher) first, before upgrading the jira-ical-feed plugin in JIRA.